In the fast-paced environment of a bar it’s vital to deliver smooth, quick and efficient service each and every time, while looking for opportunities to enhance the customers’ experience and drive sales. Speed often requires experience, with your movements eventually becoming second nature, but being organised and efficient in the way that you work will also help with speed while keeping quality standards in place. You need to prepare your bar so it meets your business needs and the customer’s drink preferences. A good way to speed up service is a good workstation setup procedure. By ensuring this set up is consistent, it will help everyone in the team to work more efficiently. This means that products, glassware, tools and garnishes are positioned nearby and the bar is neat and ready to please your first customer. Have a set procedure for the way that you prepare cocktails and rounds of drinks. Tidy as you go and put everything back where it belongs once you’re finished. Remember the 2 step rule - this means that you have all your essential equipment within two footsteps which makes sure there are no delays when you are serving customers. A great way to speed up service is to prioritise duties. There are many tasks to perform when on a shift, but prioritising these tasks helps you to work efficiently and use your initiative in finding something to do when it’s quiet. The first priority will always be the customer. When a customer arrives at the bar or their table they should be immediately acknowledged and served as soon as possible. You should also be attentive and alert for a customer’s second order. This is where you receive customers, so ensure that the bar top is clear of glassware and litter, wiped clean of any spillages and drinks menus are present, clean and complete. Make sure that your stock looks as inviting as possible. All products should be orderly with labels facing forward. Also, if all stock is in place, then you will be able to find products more easily. Ensure your area is equipped with everything you need for service. Tidy and re-stock as you go. 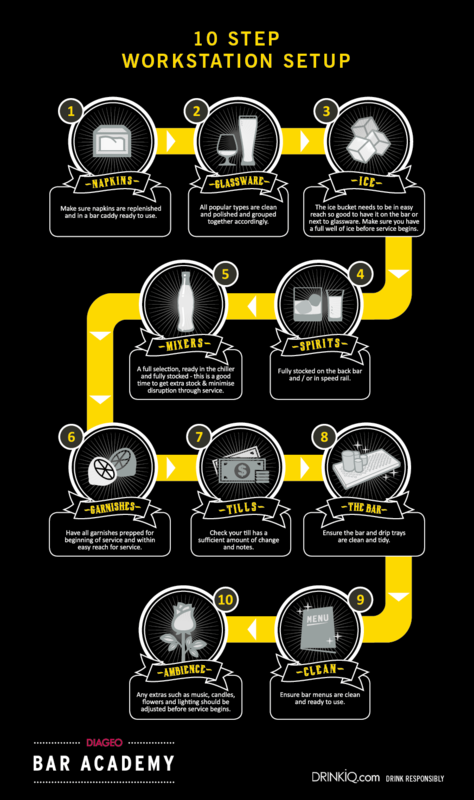 By preparing to be busy at all times, you’ll never get caught out by a rush at the bar. This includes anything that takes you off the bar and out of service, such as, collecting and washing glasses, fetching stock and ice or stocking shelves and fridges. 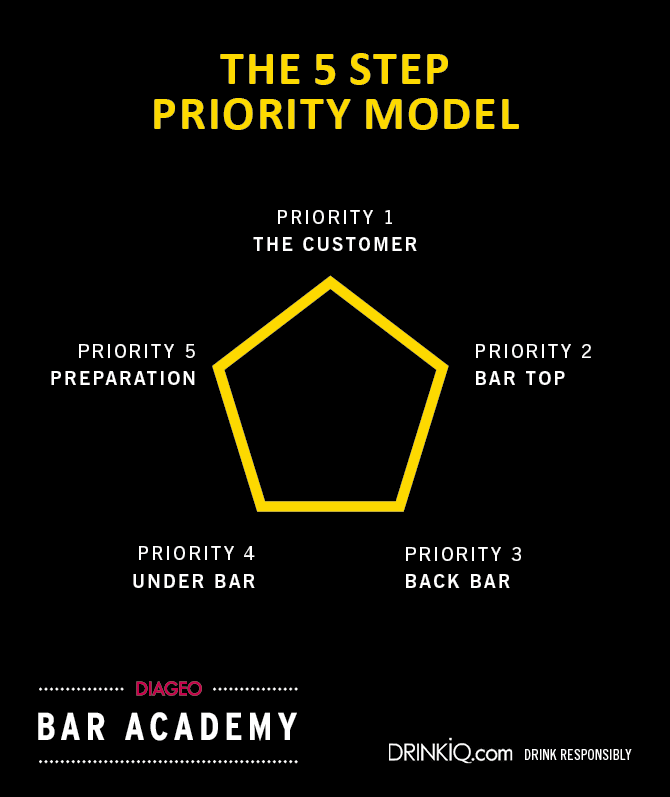 If a customer approaches the bar, drop what you’re doing and go back to priority 1. If you do this then the other priorities should follow as you will naturally choose to complete the task your customer will appreciate most. HOW MANY STAFF ARE ON SHIFT? Each bartender on shift wastes one cocktail at £7.50, every day. Each bartender on shift wastes two whiskies at £4.10, every day. Bartenders and serving staff on shift waste three gin and tonics at £5.20, every day. Over pouring can be caused by a lack of practise or carelessness. Make sure that you practise your pouring skills and focus on the task at hand when pouring and measuring drinks. Over pouring spirits can ruin the taste of the drink and will cost you money. Preparing wrong orders can be caused by poor communication or carelessness. Repeat the order back to the customer or double check if you are unsure. Always pay attention when taking orders and preparing drinks, good communication is essential. Leaking pourers are caused by poorly maintained equipment. Make sure that pourers and optics are repaired and cleaned regularly. *These costs are for illustrative purposes only and as such may not accurately represent current vacancies in exchange rates and market trends.